SAN DIEGO SHOWDOWN: The Dodgers, who have the Majors’ best spring winning percentage at .647, take on the Padres for the second and final time this spring after beating San Diego, 1-0, on March 12 in Peoria. The clubs will play again in just 12 days, on April 6 - Opening Day at Dodger Stadium - for the first of 19 regular-season meetings. A CASE OF THE MONDAYS: The Dodgers rallied for three runs in the eighth inning on Monday to down the D-backs, 7-4, at Camelback Ranch. Jimmy Rollins, who is batting .316 in 13 Cactus League games, tripled and scored during Los Angeles’ third-inning rally, and Kiké Hernandez went 2-for-2 with an RBI single in the fourth inning. Chris Anderson made the spot start for the Dodgers, allowing one run on four hits in 3.0 innings, and Daniel Coulombe picked up the win after retiring all three batters he faced in the eighth and ninth innings. Following Monday’s game, the Dodgers optioned Coulombe to minor league camp. MEANWHILE ON THE MINOR LEAGUE SIDE…: While the majority of the Dodgers were off yesterday, Brett Anderson and Mike Adams pitched in minor league games against the Brewers. Anderson threw 79 pitches in the High-A game, allowing three runs on nine hits with five strikeouts in 5.2 innings, and Adams needed just 13 pitches to strike out the side in his only inning in a Low-A contest. Today, Carl Crawford will receive extra at-bats on the minor league side in the Dodgers’ Single-A game against the Rangers. A.J. Ellis is expected to do the same tomorrow. 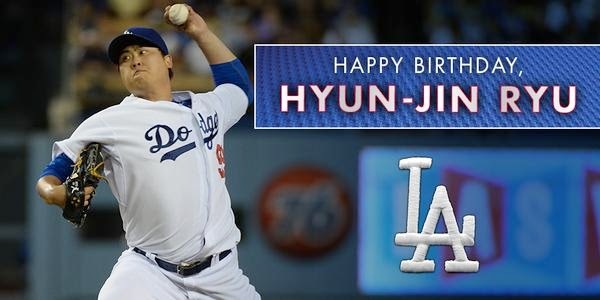 THEY SAY IT’S YOUR BIRTHDAY: The Dodgers would like to wish a very happy birthday to left-hander Hyun-Jin Ryu, who turns 28 today! Ryu, who hasn’t pitched since March 17, underwent a contrast MRI in Los Angeles on Monday, which showed no changes since his 2012 MRI. The Dodgers plan to rest and rehab Ryu for two weeks before re-evaluating him at that time to determine his throwing progression. SUCH A JOC: Joc Pederson has posted a .415/.455/.732 slashline this spring and continues to rank among the NL leaders in runs (10, T-3rd), hits (17, 2nd), batting average (.415, 3rd) and total bases (30, 3rd), on-base percentage (.455, 7th) and slugging percentage (.732, 1st). Despite not having an official at-bat on Monday, Justin Turner’s 10-game hitting streak came to an end, terminating after he was hit by a pitch and a third-inning sacrifice fly without a hit. He’s batting .469 with four doubles, two homers and seven RBI, while posting a .500 on-base percentage and a .781 slugging percentage in 13 Cactus League games. Kiké Hernandez went 2-for-2 with an RBI and a run scored on Monday, as he continued to swing a hot bat. Hernandez has hit safely in his last six contests, batting .500 (7-for-14) with six runs scored, a double, three homers and four RBI since March 18. 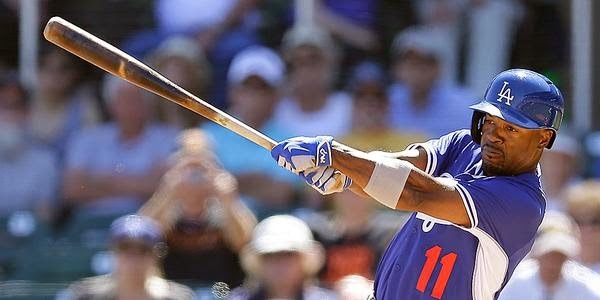 The Dodgers have been going deep at a frenetic pace of late and continue to lead the Major Leagues with 33 home runs. ON THE MOUND: RHP Juan Nicasio will make his first start in his sixth appearance of the spring today. Nicasio has made three consecutive scoreless appearances, including striking out four in 2.0 scoreless frames in his last outing on Saturday against the Rangers. RHP Dustin McGowan will make his sixth appearance of the spring today, last pitching 2.0 scoreless innings on Saturday against the Rockies. RHP Sergio Santos has allowed just one run and struck out nine in 6.0 innings in six outings this spring. He last pitched on Saturday against the Rockies at Talking Stick. LHP J.P. Howell will make his sixth appearance of the spring today, last pitching a scoreless inning on Sunday against the Indians. LHP Paco Rodriguez has allowed just three hits and struck out seven in 6.0 scoreless innings this spring, last pitching on Sunday against the Indians. RHP David Aardsma has tossed scoreless relief in five of six appearances this spring, last pitching on Sunday against the Indians. RHP Yimi Garcia has nine strikeouts in 7.1 scoreless innings this spring, last pitching 1.2 innings on Sunday against Cleveland. Brandon League will have an MRI on his right shoulder today. He has made two appearances this spring, last pitching on March 9.